If we take a different point of view and make the right choices, we can prevent deaths that occur from the use of drugs or alcohol. Peers, family members, sports figures, movie stars and rock stars all influence our lives. These individuals can be very persuasive when it comes to making certain decisions. The way we dress, the music we listen to, the car we want to drive and the way we act all stem from what we perceive to be a cool life. All too often we hear about our role models making improper choices and paying the consequences. Young people can make the same bad choices in an attempt to be popular, trendy and part of the in-crowd; rather than learning from others' mistakes, they make some of the same bad choices. We need to break the cycle. We need to make the right choice, not just in terms of our driving behaviors, but in our lives. College basketball player Len Bias, a role model, was a superstar athlete who signed with the NBA. To celebrate his good fortune he threw a party. He was on top of the world, with a great future, a lot of money, popularity, and in great physical shape. At the party a guest brought some friends that the Bias family did not know. They had a variety of drugs, including cocaine. Len had a few drinks and his judgment was poor, so when he was offered the illegal substances, he accepted. After taking the cocaine, he died. According to his friends,it was the first time Len had ever taken any drugs. Gone: The Fame, the contract, the NBA career, the money. Everything, gone! This is ahorrible example of how someone in the best physical condition of her or his life is struck down by making a decision based on bad judgment. Actor Heath Ledger died as a result of accidental overdose of prescription drugs. It is important to remember how each one of us can be a positive or negative force in someone else's life. Being a role model and influencing your friends to make the right choices carries a big responsibility. You can have an impact. 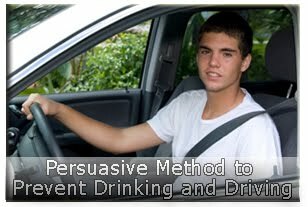 Persuading a friend not to drive while impaired may appear not to be cool, but you might save your friend's life by doing so. Saying no to a friend who is trying to persuade you to drink or take drugs is the right choice. It demonstrates that you can be your own person. You are in charge. Being your own person and making your own decisions may seem difficult and unpopular at times, but in the long run you will be a better person for it. You're an individual in control of your destiny who won't be persuaded into making the wrong choices. Each of us can be a positive role model for others, in setting an example, by avoiding the use of alcohol and drugs. This "Positive Persuasion" method will have an impact not only on your driving behaviors, but also on your personal relationships. IT CAN'T HAPPEN TO ME!!! BUT IT DOES.....and more often than we know about! These negative examples show how dangerous alcohol and drugs can be even without getting behind the wheel of a motor vehicle. When we are behind the wheel, we must maintain control over the vehicle at all times. Register Florida Drug and Alcohol Test Course Now!